By viewing this website and using the information provided on it, you become a user of this website and the user agrees to these conditions. The details on this website are meant for general information and are therefore not comprehensive. Appendee reserves the right to change these details without any further notification. 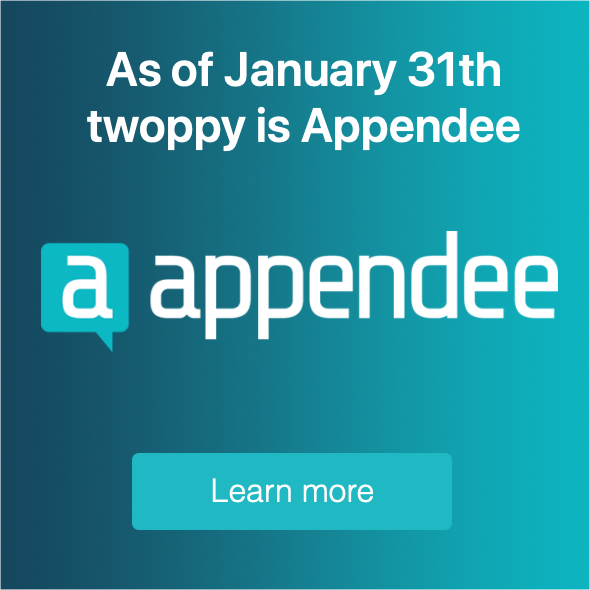 Appendee will not be liable for the consequences of adjusting this website. In composing, supplementing, amending and maintaining this website Appendee observes the utmost care. However, Appendee does not guarantee that the information provided is accurate, complete and up to date and that the availability and operation of this website will be faultless and/or uninterrupted. You cannot derive any rights from the information provided on this website. Appendee will not be liable for any loss that is or threatens to be inflicted and which arises from the use of this website or the impossibility of being able to consult this website. All rights with regard to the information presented on this website are reserved. Therefore the user of this website is not allowed without the prior, explicit and written consent of Appendee to use the information for his own use, to disclose the information in whole or in part in any way whatsoever, to reproduce it or provide it to a third party. The intellectual property rights of all information placed on this website by the user, possibly through Appendee, are vested in you. By placing information you grant Appendee by operation of law an unencumbered, global, non-exclusive license, free of charge, to use, reproduce, distribute and disclose this information with regard to the services of Appendee as well as the marketing and/or promotional purposes of Appendee. This license is also understood to cover Appendee’s right to allow third parties to use the information and to allow third parties to reproduce these files. You acknowledge and accept the possibility of other site visitors to use and reproduce the information placed by you. Appendee will not be liable for the compliance by other users with your rights and will not be liable for any loss arising from this. You guarantee that you have the full title to the information you place on the website and that you are fully authorised to grant the license referred to above. If you consult a website of third parties via this website (via a link), Appendee points out to you that this information is provided by that third party. Therefore Appendee does not accept any liability for the content of those websites. The mere linking to or connection with these files or websites does not constitute a validation of them. Unauthorised or improper use of websites of third parties or their contents might constitute an infringement of the rights of this third party including the intellectual property right and the right to privacy. Appendee reserves the right to refuse any party access to this website or to restrict fully or partly the use of this website. To this end Appendee reserves the right to monitor any access to this website. If Appendee or its employees, suppliers, partners, licensees or the writer of this disclaimer would be sued in or outside Court by any third party due to or as a result of your use of this website, the information placed on it by you or the license granted by you, you will indemnify Appendee now for then and at Appendee’s first request. For questions with regard to this disclaimer, this website or Appendee please contact contactus@appendee.com.